Thompson: I grew up in Rochester, Michigan but now reside in beautiful Denver, North Carolina. I have been married to my coach/trainer for the last five years. I have taught seventh grade mathematics at East Lincoln Middle School for the last six years and love it. I have received my National Board Certification for teachers and was just voted as Teacher of the Year at my school! I love the outdoors and wake boarding on Lake Norman. My powerlifting accomplishments are: USAPL National Bench Press Champion for the last two years. I took third, second, first and second place at the I.P.F. 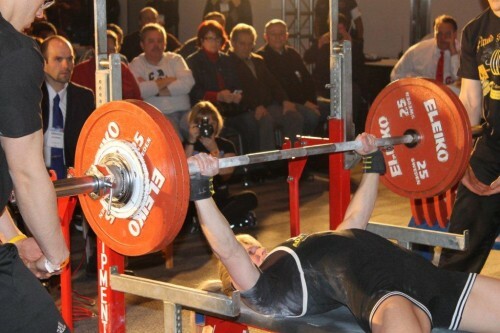 World Bench Press Championships. I have broken the 132 pound World Bench Press record twice. I have placed second at the USAPL National Women’s Powerlifting Championships twice. I have never been worse then third in any international competition. I also just became the North Carolina State Chair for USA Powerlifting. Thompson: My best competition lifts are at 132 pounds are: bench 292 lb., squat 320lb., deadlift 375lb. I have benched 315lbs . at a local non sanctioned meet. BT: A 315LBS BENCH FOR A WOMEN AROUND 130LBS IS AMAZING!!! WERE YOU ALWAYS VERY STRONG? Thompson: No. When I first started benching I was doing three sets of five at 65 pounds. I couldn’t wait to get to a 135 bench – now I warm up with it. I was always a very skinny girl and was a long distance runner before I started lifting. BT: DO YOU DO ANY CARDIO? Thompson: No. The most cardio I get is when I am wake boarding or walking up and down the stairs. I think it goes against the purpose of weight training. I want to build up muscle, not break it down. BT: WHAT DO YOU LIKE TO DO WHEN YOU AREN’T COMPETITING AND TRAINING? Thompson: When I am not training I like to work in my yard and go wake boarding. My husband tells everyone that I am an avid shopper. BT: HOW DID IT FEEL WHEN YOU SET A WORLD RECORD? Thompson: Totally awesome. It has been a goal of mine that seemed to elude me my first years of competing. I knew I could do it but struggled with cutting weight and competition jitters (aka diarrhea). I have that fixed now. BT: HOW DOES IT FEEL WHEN YOU CAN OUT BENCH 98%-99% OF THE MEN WHO WEIGH OVER 200LBS WHEN YOUR A WOMEN UNDER 132LBS? Thompson: It’s pretty cool. My family and friends like to boast about it the most. My students think it is neat that I can out bench their dads. When I meet my student’s parents they usually say ” I thought you would be bigger”. I take that as a compliment. BT: WHO WAS YOUR MENTOR? Thompson: I really just kind of fell into the sport, so I didn’t have anyone that I was looking up to. When I started weight training I looked up to Cory Everson because she represented a strong athletic woman that was beautiful and feminine. BT: WHO DO YOU THINK THE GREATEST BENCHER EVER IS? Thompson: Besides me? Just kidding. I think Deb Ferrell is one of the greatest female benchers. She is the first drug free female to bench over 400 pounds. Mike Hara is one of the best pound for pound benchers I have seen (529@160) with his great “elbows out” technique. Dennis Cieri is one of the strongest benchers I have seen who relies on purely raw strength. I have to add in my workout partners Jason Geml and Dave Schmidt. Jason can bench about half of his body weight and Dave is a six foot, two hundred pound guy that is still trying to catch up to me. Sorry guys, I had to put in a dig. BT: WHAT TRAINING STYLE DO YOU TRAIN? WHAT’S YOUR ROUTINE? WHAT ROUTINE DO YOU THINK WORKS THE BEST? Thompson: This is my fifth year of competing. Thompson: Partners are very important, mostly for motivation. I know I will never miss a workout because everyone else will be there to do it with me. I also never leave a workout where I am not pumped up and exhausted. We encourage each other through the workouts to do our bests or sometimes goat each other into lifting heavy weights out of embarrassment. Negative reinforcement can work pretty well sometimes. BT: WHAT MADE YOU WANT TO BECOME A WORLD CHAMPION IN THE BENCH PRESS? Thompson: It is something that only the elite can achieve. I always strive to do my best and like to set higher and higher goals. I want to put my mark on powerlifting and hope to achieve many more World Championships. BT: WHAT IS YOUR FAVORITE EXERCISE OTHER THAN BENCHING? Thompson: I love the deadlift. I am not very good at technique and the deadlift doesn’t require much. Plus I have made a lot of gains in this exercise in the last year so I get excited to work on them. Thompson: Mostly I would say that beginners get stuck in routines. You need to change up workouts and strive to reach heavier weights. Too often I see women in the gym that pick up the same dumbbells and do the same routine over and over never making any real progress. Girls, lift heavy you won’t get too big or bulky, guys like muscle. Thompson: My advice would be to work with someone that is familiar with weight training. It is important to have good form. Also, I believe in logging your exercises, weights used and reps accomplished. I think this helps chart your progress and keep up your motivation. Lastly, it is important to have a wide range of goals, from daily to lifetime goals. Set your goals small but always be working for the big prize at the end. If a little skinny runner can be one of the best benchers in the world why can’t you? BT: DO YOU HAVE ANY FUNNY STORIES YOU WOULD LIKE TO SHARE? Thompson: We had a WWF wrestler come to our school to give a motivational talk to our students during gym class. When he opened up for questions my students challenged him to arm wrestle me. I thought it was pretty funny that they thought I could beat this six foot five, three hundred pound wrestler. When he refused my students started chanting and wouldn’t leave him alone. It’s funny that even though I am only 132 pounds my students think I can leap tall buildings in a single bound! We had Steve Buerlien come to our school (he was then the quarterback for the Carolina Panthers) to talk with the kids about staying in school and working hard. Half way through the assembly he asked to meet me and introduced himself. He had read about me in the newspaper and wanted to meet the World Champion teacher. Needless to say, he thought I would be bigger. My students couldn’t get over the fact that an NFL quarterback would want to meet me, their teacher. BT: WHAT ARE SOME OF YOUR MOST MEMORABLE POWERLIFTING AND BODYBUILDING EXPERIENCES? Thompson: The World Championships is definitely the most memorable. There is nothing like hearing the National Anthem in front of all those athletes from other countries. I felt an enormous amount of pride and honor to be on the first place stand while the Star Spangled Banner played. Records are nice, but when you are halfway around the world and they play the Anthem in your honor it takes your breath away. Thompson: I would like to win some more World Championships. I would like to make it to the World Powerlifting Championships and put in a competitive performance. A few more World Records would be nice too. BT: WHAT DO YOU THINK IS THE MOST IMPORTANT FACTOR WHEN IT COMES TO INCREASING YOUR BENCH MAX? Thompson: It is very important to listen to your body and avoid over training. I cannot stress enough how important sleep is, especially naps. When I notice I am having trouble sleeping or my muscles are very achy, I will take and accessory day off from my training. It is important to listen to your body so that you have enough rest to build the strength you need to max out. Thompson: I would love to see powerlifting as an Olympic sport. The number of Powerlifters outnumber the weight lifters by the thousands. Powerlifting already is a huge international sport. I don’t think the excuses of drug testing and sponsorships are valid. If badminton and synchronized diving can be Olympic sports and powerlifting can’t – there is a problem. We are already in the World Games and I think the Olympics are the next natural progression. We are ready! Thompson: I think benching will stay a strong sport. It is an exercise that everyone understands and relates to. Most people will ask you what you bench to gauge how strong you are. I think some of the equipment has gotten a little crazy. I have heard of people using duct tape around bench shirts or taping themselves to the bench – that is a little extreme and in my opinion degrades the sport. Thompson: Protein, protein and more protein. I try to get a little over one gram of protein per pound of body weight. I start off my morning with a Protein shake in fat free milk. I have a rotein bar mid-morning and then some sort of chicken dish for lunch. I have another bar in the afternoon and take creatine before I work out. After my workout I have a SportPharma Lean Protein shake and then usually chicken and rice for dinner. I am a supplement junkie, but this stuff tastes great. BT: WHAT ARE SOME OF YOUR MOTIVATIONAL QUOTES? Thompson: Desire. Dedication. A champion never misses a workout and doesn’t use excuses. Thompson: I believe in supportive gear. I think Inzer Advance Designs has a great line of supportive gear that allows athletes to have longer, competitive careers. Realistically, if you wanted to know who was the strongest lifter you would go raw. Thompson: I stay away from cycling. I think this type of workout builds you up to your peak performance, but you better hope that falls on your competition day. I prefer using straight sets. I work on getting three sets of five reps on all my major exercises. This is what has gotten me strong and even on a bad day I know I can perform well because I have a good solid base of strength. Thompson: Totally, I think my routine is probably considered more of a bodybuilder routine. I think the accessory exercises are important and help the increase performance in powerlifting. Plus having a nice, symmetrical physique is important to me. Thompson: Mostly, I have learned that the powerlifting community is a great group of people. You can learn from each other and exchange routines and then be a total competitor.